April 30th - May 12th - Size always matters! This festival, dedicated to a movie format over 50 years old, is a dream for a lot of movie fans around the world. Today, movies and cinemas have reached a time of change – a change from film based to digital cinema and a change in the way movies are felt and understood. We are sure, that our 70mm Festival presented in our newly renovated cinema not only will make you remember cinema-going from a time long ago, but also make you aware of the responsibility we all have: To honour the genius of so many people who have given us stories and unforgettable moments in breathtaking and crystal clear large format pictures. A mix of newly restored classics, ultra rare 70mm features and big screen classics. We look forward to seeing you.....! Lasse Kolstad and Kåre Berland are most likely to attend the screening. Harald Tusberg and Sven Erik Liebaek are also invited, as well as representatives from the Christian Radich Foundation. An invitation to the King of Norway will also be sent, maybe he will enjoy the film as much as he did back at the European premiere screening at the Colosseum cinema April 25th 1958. 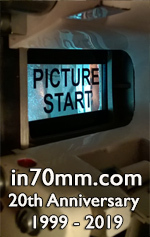 New 70mm print of "Flying Clipper"
20.00 "Lawrence of Arabia" 1962, 227mins with intermission. Filmed in 65mm Super Panavision 70 and presented in 70mm, 6-track magnetic Dolby Stereo. 20:30 "Lawrence of Arabia". 1962, 227mins with intermission. Filmed in 65mm Super Panavision 70 and presented in 70mm, 6-track magnetic Dolby Stereo. 5 front channels with ElectroVoice VariplexII, refurbished with BMS drivers. Festival tickets NOK 50,- ($8.50) . You will also need a festival card, NOK 50,- ($8.50). A special festival card including ALL screenings NOK 400,- ($68). Just 5 minutes away from the cinema. Old boat converted to B&B. Cheapest alternative! Centrally located, near the Castle. 15 minutes walking distance to the cinema. Best value! In the same street as the cinema, 2 minutes walking distance. Great value!